….with foot attached! For the past couple of weeks, I’ve been drawing something every day in my art journal. Really trying to get better at drawing, as I find it a fun and useful skill. I appreciate it even more now, because I told myself all my life (as many do) that I can’t draw! Very cool to prove myself wrong in my journal. The other night, nothing was calling me to draw it, but my foot happened to be hanging out in the local area, so I drew it. Since that didn’t fill the whole page, and looked kinda boring in graphite, I decided to zip it up a bit with some Tombow markers. And blended the colors out with the colorless blender. And since the page still wasn’t full and I was in a colorful mood, I added some Inktense pencils, then went back and liquified it. Well, this’ll wake you up on a Monday morning! I hope you got a laugh out of it, anyhow. What are art journals for? That’s right. F-U-N! Happy Monday! Smell some flowers, hug some trees, make it a good day today. Flinging peace and happiness from my little corner of the world! Thank you, Lance. I wish every adult who felt that way could come to art like a first grader. It would make them better people and the world a better place. IMO. 🙂 It’s sad the stories we believe about ourselves sometimes. Psychedelic! I like it…but contrary to your feelings, the original drawing is not boring at all. Fun to see the change that color makes. Rainbow foot! LOVE it! So creative! Flinging rainbow confetti on this rainy day that you brightened already! Hey, that looks familiar! LOL! 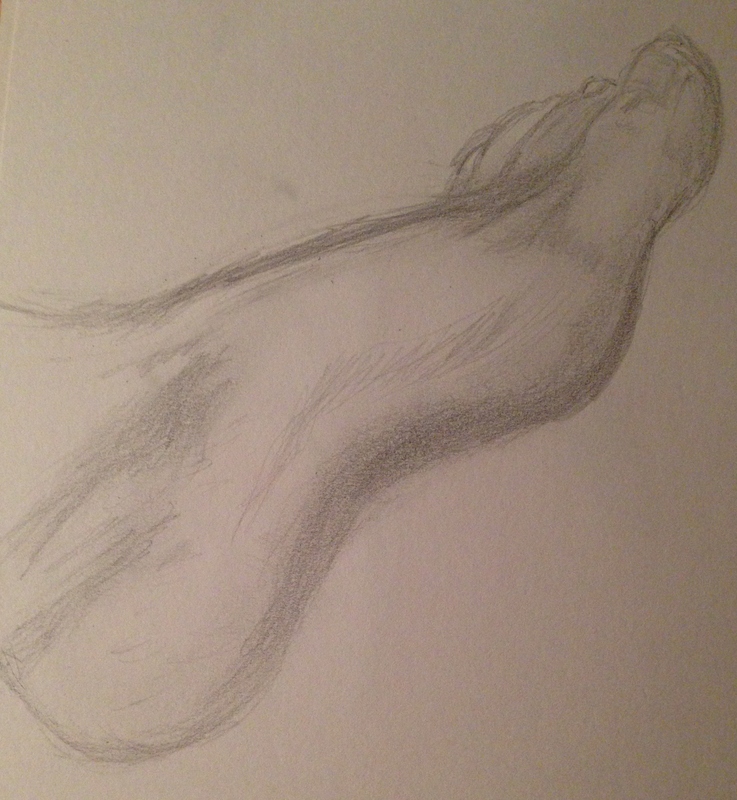 I had to draw my son’s foot (because I was wearing socks), but that’s the same angle. Terrific drawing! As I mentioned before, feet are much harder than hands to draw. Thanks, Teresa! I think hands are more difficult (for me, anyway), but both are a challenge, no doubt. 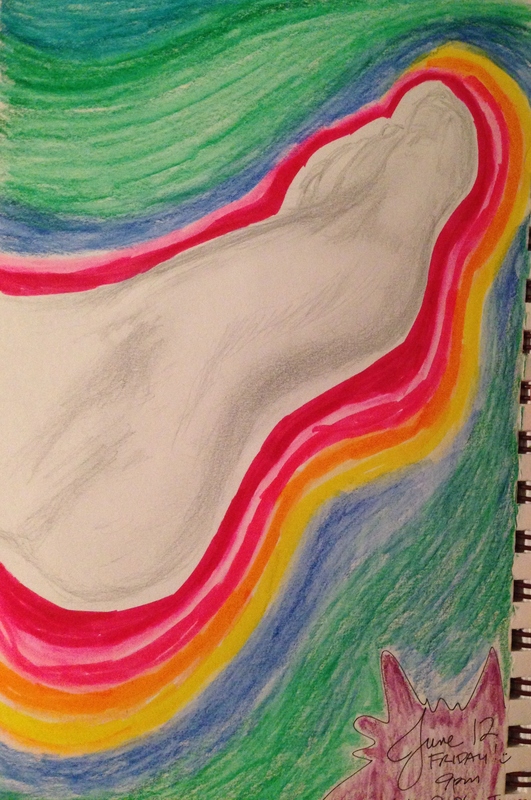 Lol, a psychedelic foot, I can tell you are having fun! That’s a great drawing! It was fine on its own, but the colors really brighten it up as well – I especially like the Tombow markers (which I still need to pick up for myself!). 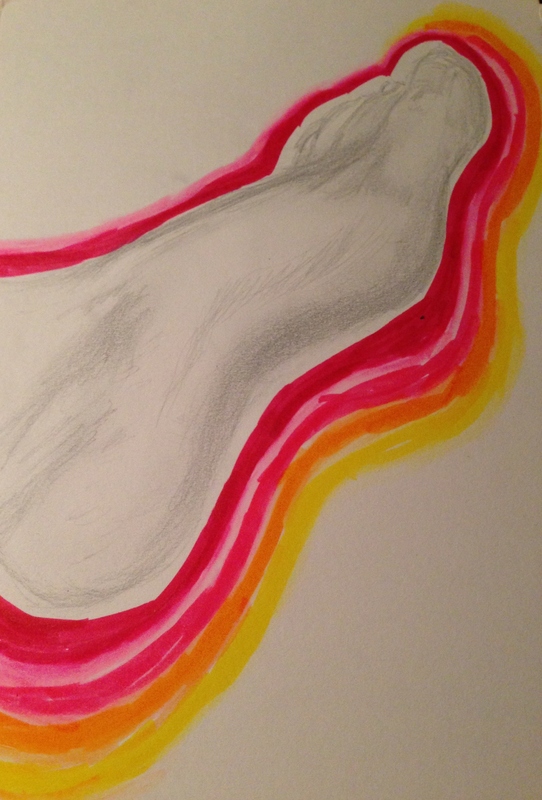 This is an excellent foot sketch and I love how creative you got with it. Thank you 🙂 I had a couple different contenders for best moment to capture the spirit of the day. In the end this one won out because of the multi-generationality of it (I may have just made up that word). I knew I had to get the reflections right though or else the picture wouldn’t have made any sense. I find water fascinating to draw. Water scares me. I’d love to work with watery subjects, but I feel it’s hard – too hard. That’s pretty much how I felt too but I also find it strangely irresistible. When I see water in a painting it feels like magic to me. I feel like there’s no way I could possibly accomplish that but at the same time I desperately want to try to understand how it’s done. * nodding head * I’ve decided to really try and focus in on beachy scenes, since that’s the kind of art I really wanna do. We’ll see how it goes. I totally agree with what you’re saying. I did do a small piece of wet sand (after following a tutorial) and it felt exactly like magic, just as you said. Just getting that little bit of a beach there on the paper. Beaches are so beautiful and so daunting to draw. Water in motion is the most magical thing of all. Isn’t it? And the most calming, healing power I know of. Definitely! Water always makes me happy. The ocean particularly so.